Name of the triumphal ode found in Judges v. 2-31 and ascribed in the title (Judges v. 1) to Deborah; it celebrates the victory in the plain of Megiddo over Sisera and his army. The song belongs to the earlier poetry of the Hebrews, but shows such a remarkable power of expression and such a spontaneity that it takes a high place among the masterpieces of the world's poetic literature. The Masoretic text, while exhibiting corruptions and obscurities, may be said on the whole to be fairly faithful to the original. It has, however, been in the way of all attempts to reduce the poem to meter and divide it into regular strophes. The principal pauses occur after v. 11 and v. 22, and the prevailing rhythm has four beats to the line. The poem opens, after the summons to praise Yhwh, in which the kings of the surrounding nations are asked to join, with the description of Yhwh's marching forth from Seir (verses 2-5). 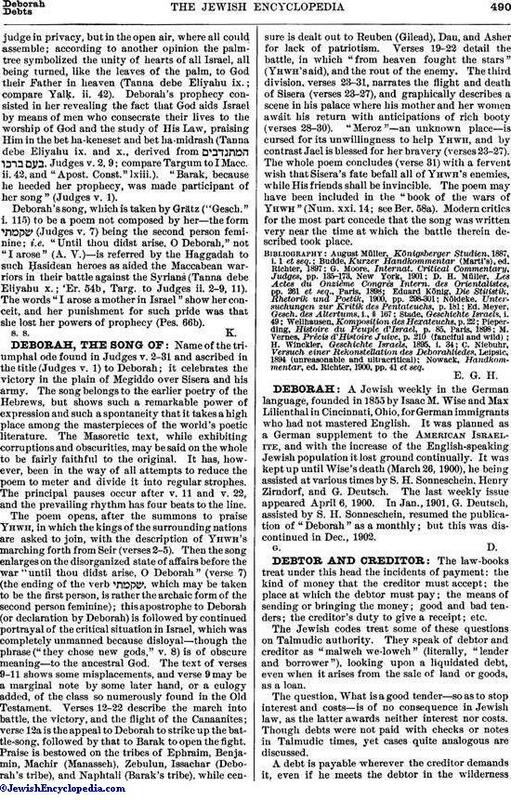 Then the song enlarges on the disorganized state of affairs before the war "until thou didst arise, O Deborah" (verse 7) (the ending of the verb , which may be taken to be the first person, is rather the archaic form of the second person feminine); this apostrophe to Deborah (or declaration by Deborah) is followed by continued portrayal of the critical situation in Israel, which was completely unmanned because disloyal—though the phrase ("they chose new gods," v. 8) is of obscure meaning—to the ancestral God. The text of verses 9-11 shows some misplacements, and verse 9 may be a marginal note by some later hand, or a culogy added, of the class so numerously found in the Old Testament. Verses 12-22 describe the march into battle, the victory, and the flight of the Canaanites; verse 12a is the appeal to Deborah to strike up the battle-song, followed by that to Barak to open the fight. Praise is bestowed on the tribes of Ephraim, Benjamin, Machir (Manasseh), Zebulun, Issachar (Deborah's tribe), and Naphtali (Barak's tribe), while censure is dealt out to Reuben (Gilead), Dan, and Asher for lack of patriotism. Verses 19-22 detail the battle, in which "from heaven fought the stars" (Yhwh's aid), and the rout of the enemy. The third division, verses 23-31, narrates the flight and death of Sisera (verses 23-27), and graphically describes a scene in his palace where his mother and her women await his return with anticipations of rich booty (verses 28-30). "Meroz"—an unknown place—is cursed for its unwillingness to help Yhwh, and by contrast Jael is blessed for her bravery (verses 23-27). The whole poem concludes (verse 31) with a fervent wish that Sisera's fate befall all of Yhwh's enemies, while His friends shall be invincible. The poem may have been included in the "book of the wars of Yhwh" (Num. xxi. 14; see Ber. 58a). Modern critics for the most part concede that the song was written very near the time at which the battle therein described took place. Nowack, Handkommentar, ed. Richter, 1900, pp. 41 et seq.